The best weddings photographers in Arizona specializing in adventure elopements and intimate weddings. This directory of the best elopement photographers is based in Arizona or works in Arizona full-time. To search our global directory of photographers, check out our Elopement Photographers By Location Page. Hi, I’m Erika! I’m an adventurous wedding + elopement + couples photographer based in the beautiful Arizona desert. I don’t stay in one place for too long though. I have a traveler’s heart and a free spirit. I’m happiest when I’m out in nature enjoying this crazy amazing world we live in. I’m even happier when my husband and two pups are with me. I started photography 5 years ago because I wanted to document my own life and adventures. The funny thing is, I ended up falling head over heels in love with documenting others. Nothing makes my heart beat faster than capturing the connection between two beautiful souls who are crazy about each other. I’m all about capturing real moments. The moments you’ll look back on and feel something. Hi, I am Traci! I am a southern girl living in the desert following my travel/photography dreams. After working for three years in the commercial and golf photography industry I dropped everything to move some place that made me happy and get reconnected with couples. I photograph elopements, small intimate weddings and in home sessions. 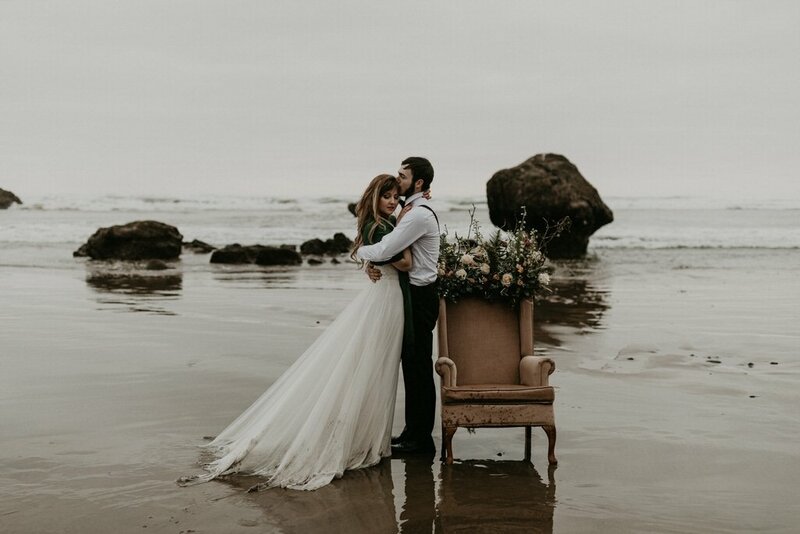 My style tends to be on the more moody, dramatic side, but I also have a light and airy side depending on the couple and location. I also offer a wedding dress rental program to my brides from designers like Rosa Clara and Monique Lhuillier. I am based in the Arizona/Utah area, but always up for travel! When I am not behind the camera you can catch me hiking, camping, riding horses or enjoying a good meal and cocktail! Adventurous, creative, and your new best friends. We are Jenny and Aaron, wife and husband. We are obsessed with two things in life, photography and our dog. While working with us we create a space that is safe, comfortable, and fun. We are most interested in learning about who you are as a person in order to capture your essence in your photos. We don’t take “portraits” we capture love and joy with a whole lot of soul. Hello! I’m an adventurous wedding and elopement photographer based out of Phoenix, Arizona, but I like to wander just about anywhere. Born and raised in the desert, I am a sucker for a dramatic landscape and a couple who isn’t afraid to be themselves. I aim to capture your love in its authentic state, with real emotions and good vibes. I do what I do so that twenty years from now, you can look back at your photographs and say yes, that was us, all of it – the craziness, the laughter, the love. It would be an honor to capture these moments for you, so let’s get off the beaten track and make some memories. When I’m not out trailblazing with my camera in hand, I like to travel, hang out with my husband and dog, check out new restaurants, and watch home renovation shows. Hi my name is Kali and I am the lady behind the camera! I am a full time wedding + elopement + couples photographer based in the beautiful state of Arizona. My photography journey started about 2 years ago when I found that capturing couples madly in love in epic places makes my heart beat the hardest. Overall I value connection and getting to know people. I love hearing about how you two met, the proposal and all of the unique things about your relationship. When you look back at your photos in 20 years I want you two to remember exactly how you felt at this time in your life. When I am not behind my camera you can find me on a plane or in a car traveling to a new place, taking my rescue puppy on hikes or curling up on my couch binge watching Netflix as my three kitties curl up with me.